Need folding knives to keep out of the danger? The strong and durable folding knife is what you need now. Let this folding knife be the last EDC knife you purchase. OERLA folding knives using the most suitable material to production of the most effective knife. Use the absolute best material at this price, fully qualified for everyday use. Peak performance never looked so good to you or your wallet. Ball bearing fastest assisted opening available! Convenient one hand opening and folding, open faster and with more purpose than any other assisted knife. The ergonomic handle shape is engineered for superior hand control. Made for any size hand slightly, and the Stainless Steel handle can easily break the glass. Liner lock design for safe use. The steel liner lock firmly Locks the blade in place when in use and eliminate the risk to be hurt by the accidental close of the blade. 1.5-inch strong pocket clip for any variety of belt or pack to make this knife easy to carry. 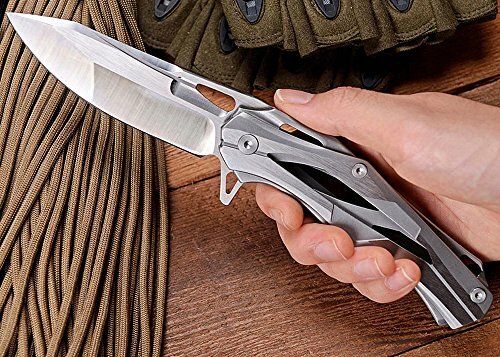 This cool knife is essential good for warehouse working, outdoor activities, survival gear, car emergency kit, hunting, fishing, walking, hiking, sailing, gardening, camping. This is the perfect general-purpose knife or collection knife. Sharp, high hardness, Cool appearance! The most popular with the men's gift! lock Type: Liner lock; assisted type: Ball bearing fast-open assist knife, convenient one hand opening and folding. Oerla knives include a limited lifetime manufacturer's warranty against defects in materials and workmanship. If you have any questions about this product by Oerla, contact us by completing and submitting the form below. If you are looking for a specif part number, please include it with your message.